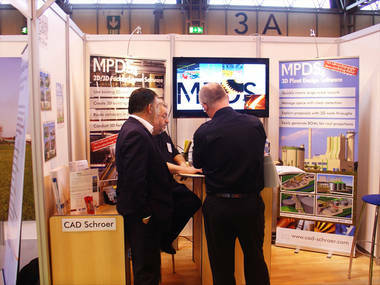 At ACHEMA and UK AD & Biogas 2012 CAD Schroer welcomed project engineers, plant providers and Owner/Operators to explore the possibilities offered by large-scale 3D plant design. Cambridge, UK and Pittsford, NY – 4 October 2012: World Congress or national conference – sustainable energy was top of the agenda at ACHEMA in Frankfurt and UK AD & Biogas in Birmingham, where project engineers had the opportunity to explore flexible, scalable 3D plant design software. ACHEMA 2012, the world congress on chemical engineering, environmental protection and biotechnology held in Frankfurt hosted 170,000 visitors and over 3,000 exhibitors. The UK AD & Biogas exhibition in Birmingham, a more niche event, attracted over 3,000 visitors and 400 exhibitors. 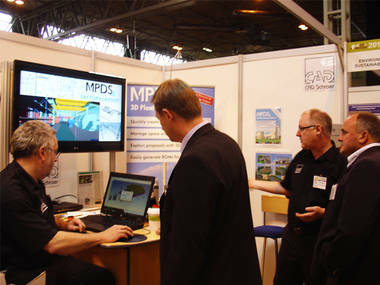 Engineering software provider CAD Schroer exhibited its MPDS4 3D plant design and factory layout software at both shows. Secure, sustainable and affordable energy was the theme at the heart of both shows, with German engineering ingenuity clearly on display at both shows in the form of energy plant and engineering solutions providers. CAD Schroer supports sustainable energy projects with a 70% software discount, making the transition to large-scale 3D plant design affordable even for smaller firms and projects. At ACHEMA 2012, CAD Schroer caught up with existing customers, from specialist brewery to aircraft component providers, as well as introducing its solutions to green energy companies. 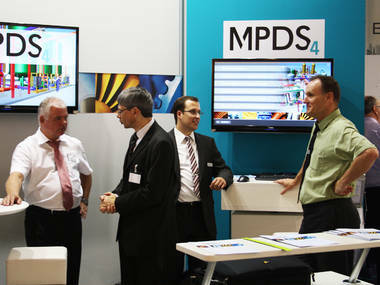 “Visitors unaware of MPDS4 were surprised to find a flexible, easy-to-implement mid-market alternative to the biggest brands in plant design,” says Sergej Schachow of CAD Schroer Germany. To find out where to see CAD Schroer and MPDS4 live in the coming months, please visit the CAD Schroer Events page.